The JamesLink kiosk was installed as a part of an ongoing effort to increase cancer awareness. The key feature of the kiosk is an online questionnaire that asks specific questions pertaining to an individual's personal and family medical history. 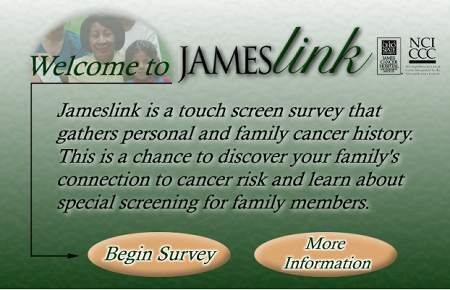 JamesLink collects cancer risk information from the user which is then screened by professional researchers. James Cancer Hospital performs follow-up outreach for users that have a cancer risk profile. The James Cancer Center will be adding more content and deploying additional cancer awareness information kiosks in a variety of highly visible locations throughout the community.